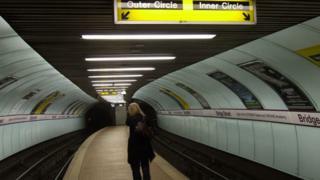 A man collapsed in a Glasgow subway station following an earlier attack in the city centre. Bridge Street station was closed on Thursday afternoon while the emergency services dealt with the incident. Police said he was taken to the Queen Elizabeth University Hospital. His condition was not known. Officer were called to the incident at 15:50 and the station was cordoned off. It reopened nearly three hours later.